NOW: The open avenue between Northgate’s first retailers was partially covered with “skyshields” in 1962, and fully enclosed in the 1970s. Perhaps the date, May 16, 1950, scribbled on the unsigned note accompanying this early portrait of Northgate’s “Miracle Mile”, may be slightly off. 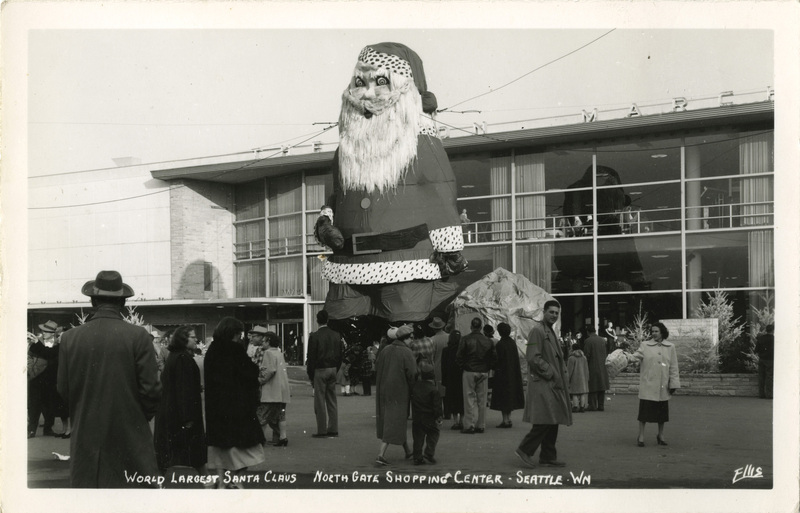 The view looks north from the center of Seattle’s first shopping mall during its, it seems. late work-in-progress. On the far left a temporary footprint map of the center is propped up to face east across the center’s ‘Main Street’ to the Bon Marche, largest and most polished of the malls structures. Built for three million dollars, the Bon was the new shopping center’s ‘anchor’ retailer. Most of the Mall’s lesser, but still large, parts kept to Quonsets, one of World War 2’s architectural preferences. 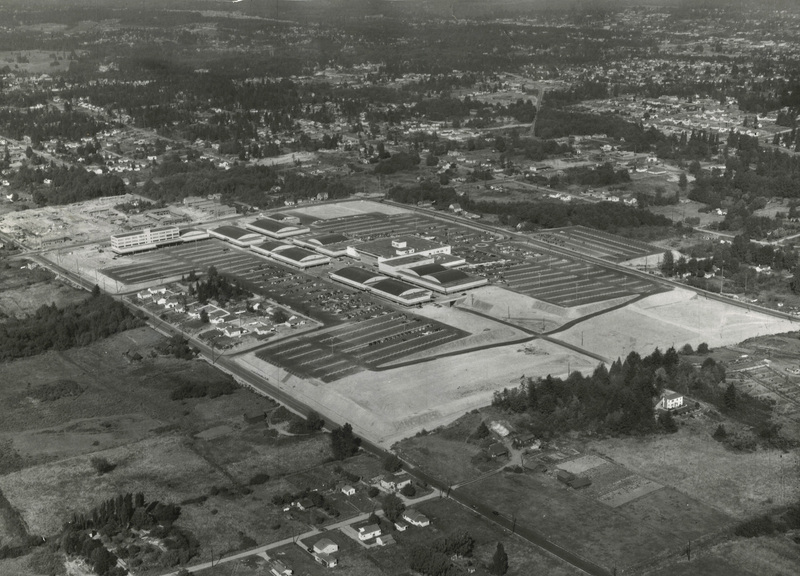 Pre-fabricated Quonsets that could be easily assembled as pre-fabricated huts or expanded to the size of warehouses like the future Nordstrom Shoes, here on the left. Northgate’s superlative Bon was never a Quonset. 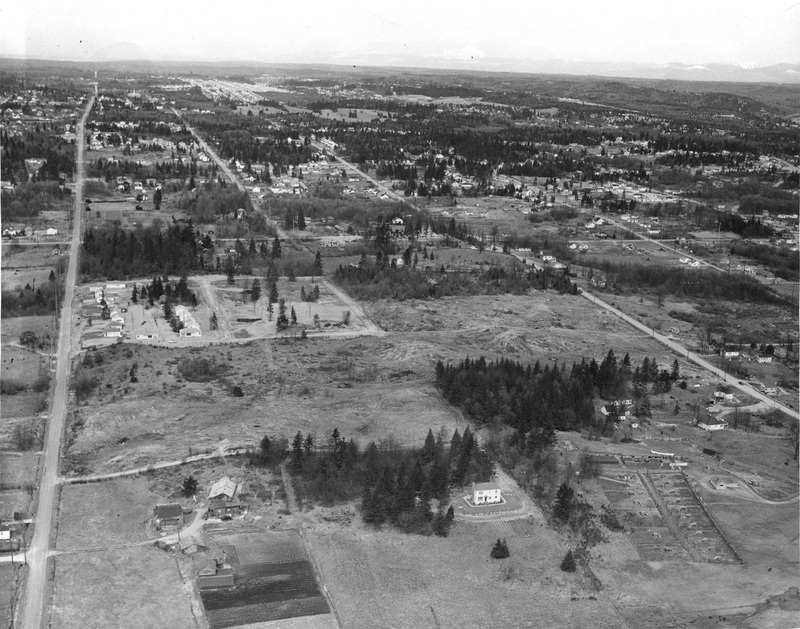 The Seattle Times for February 22, 1948 first reported that the “curtain of secrecy which has enveloped the mammoth project was pulled aside” revealing “the biggest suburban development of its type in the U.S.” The term “mall” was most often used for the north-and-south center-line of the development. In the early 1980s when I first began delivering freshly published now-then books to Seattle bookstores, I was thrilled to learn that running below the mall – the north-south center line of the by then lavish development – was an austere tunnel designed for speedy deliveries to Northgate’s many retailers, which then still included both chain and independent book stores. From its start in 1950 Northgate showed an often wild popularity that stuffed its surrounding parking lots with thousands of visitors. It was a retail flood that would soon pain the established shops in the University District, Northgate’s competing retail neighborhood to the south. 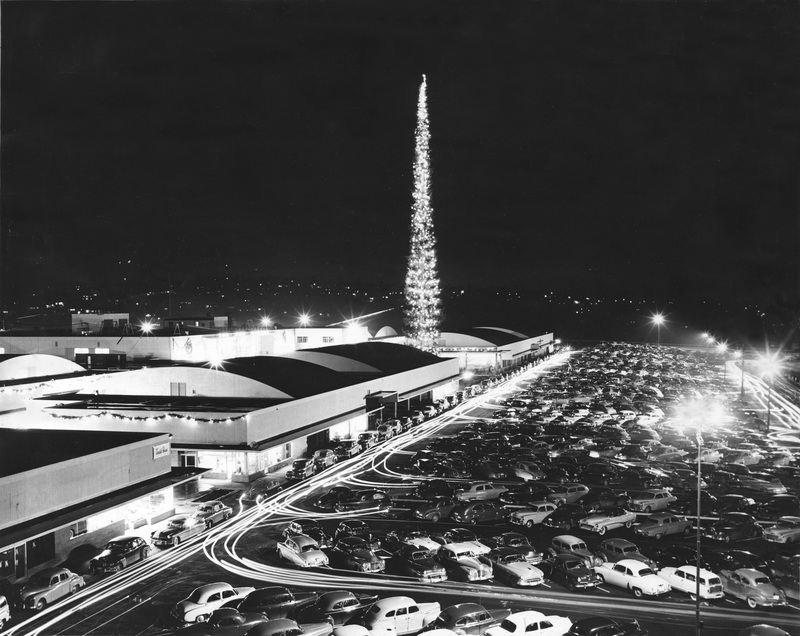 Northgate’s many remodels created a covered and heated expanse of attractions. Besides the shoppers its comforts were used by seniors for winter walks, and exploring groups of teenagers practicing consumer – and human – development. Anyone have any theories on where that picture with the Mobil gas station in the Life article was taken? I don’t think those domed shaped buildings were actually quonsets, rather the shape came from “bowstring” arch trusses, used to span large areas. If there was an open ceiling, then large glue lam arch beams were sometimes used. As a too young person living on NW 8th St. several of my buddies and I rode our bicycles out to the grand opening of Northgate the week end it actually opened. Did we ever catch “heck” when our parents found out where we had gone.